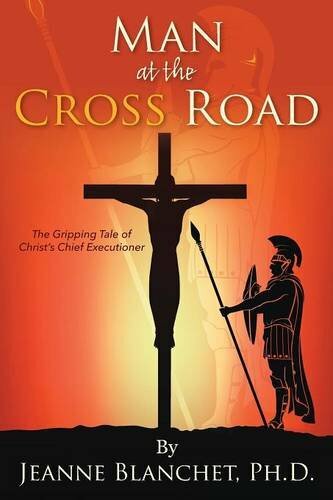 Author Jeanne Blanchet has done an amazing job in “Man at the Cross Road,” her story of the man who crucified Jesus. This is a book written in modern terminology, but instills facts that document this event. The author has done extensive research in trying to present the information on a subject that is highly sensitive and controversial. She provides excellent information on the differences in worship services, the Holy Eucharist, and beliefs. The story begins in Rome 30 CE where readers meet the family of Sextus Cascas, who are awaiting the return of their son Marcus after serving in the Roman Army. Each family member reflects on their memories of Marcus and the feelings/fears they have about his return. The mother, Gnaea sees only the good in her prodigal son but at the same time remembers his defiant ways as a child. The father, Sextus, tried to be the best father he could, exposing Marcus to learning the family trade, providing trips to the theater and “guy” events. Sister Livia remembers the abusive bully who only cared about getting what he wanted, when he wanted it. Marcus returns with what we call today PTSD – he is non-communicative, hostile, and violent. His time in the Roman Army has only increased his belief that he is better than anyone else is and all others are stupid and incompetent. After advancing in the ranks of the army, he was chosen for the “death squadron.” The squadron’s goal was to crucify anyone who went against Roman law and security, and those deemed unworthy. Crucifying an individual included being stripped of all clothing, flogged, and then nailed to a cross in a public arena. The turning event for Marcus was the flogging and crucifixion of the so-called “King of Jews.” Never had any crucifixion impacted him like this one. Not only did this Jew not call out or beg for mercy, he appeared calm and spoke to the crowd and the convicts hanging next to him. Marcus couldn’t get the eyes of Jesus out of his mind and that image followed him for years. It was due to this image and memory that Marcus lost touch with reality and was sent home. Once returning home, Marcus leads a life of stealing, lying, and taking advantage of any woman he wanted. One such woman was Hadassah who was not killed but sent home. He later encounters her and her family after being found in a ditch due to illness. The topic of Jesus’ crucifixion is addressed and why it happened or was thought to happen. This was delivered very well with historical facts. The author left it up to the readers to decide if they could forgive a man who did this. Blanchet provides definitions of terminology, footnotes, maps, and further information on historical facts in the back of the book. One point made was that “No one knows for sure the hour Jesus died,” due to differences in how time was calculated within different groups. She relates that most authorities believe Jesus hung on the cross from 9:00 a.m. until his death at 3:00 p.m.
"Man at the Cross Road" by Jeanne Blanchet is an excellent read that will certainly challenge readers on their beliefs of what really happened.